Caution: This is not a boring, drawn out book filled with mind-numbing strategies, tedious facts, or uninspiring dialog. This book is straight and to the point…featuring the best passion manifesting methods that have worked for me. Not a mother? Don’t fret. 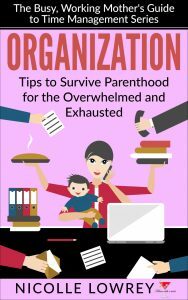 Although this book is geared towards busy, working mothers, there are oodles of tidbits for fathers, non-mothers, or just plain humans. Obviously, there’ll be some things that won’t directly apply if you’re not a mother, but the parts that do, will be worth the price of admission. Nicolle Lowrey is an around-the-clock wife and mother of three children. 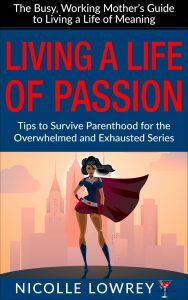 However, she manages to live a life of passion through her writing and by helping other mothers discover a fulfilled life. In her spare time, she works a full-time job and survives parenthood by finding the humor in the misadventures of her children. Woman in charge, your role has become “ring announcer for the 3 ring circus”. Do you have kids? Do you sometimes want to send them to their bedroom until puberty? And other times, do you want to hug them until they burst? What about those moments when they say something so innocent and incredibly cute or hilarious that you wish you had a pen and paper so you could remember it? Well, that’s exactly what I did. My children have given my husband and I so many gifts, but the most precious has been laughter. I made a record of each funny or cute thing that they said since the moment they could speak. It’s all here in this short yet unforgettable ‘Kids Say The Darndest Things’ style memoir. No thanks, Mommy, I peed yesterday is a witty, side-splittingly funny comedy that can be enjoyed by both young and old. Andrea Michaels is literally one of the backbones of the special events industry. Launching her business when there was no formalized or defined marketplace, she was and still is a trailblazer, pioneering the way for others to follow. Always on the cutting edge of the business, she has stacked up a pile of firsts (and 50 prestigious awards) in her legendary career – from initiating corporate branding and messaging into events and interactive themes that create experiences for the guests to entering the international market ahead of her colleagues and incorporating never-before-used technology into her events, just to name a few.